Sun is the king of the solar kingdom. Sun is worshiped as Sun God. He represents the creator, the Brahma, with his four faces to have a survey of all the four directions causing four seasons and the four elements namely Fire, Earth, Air and Water. According to Hindu Astrology Sun is the soul of Kalpurusha (The Moon is his mind, Mercury his speech, Mars his strength, Jupiter his knowledge and happiness, Venus his desire or lust, Saturn his misery). 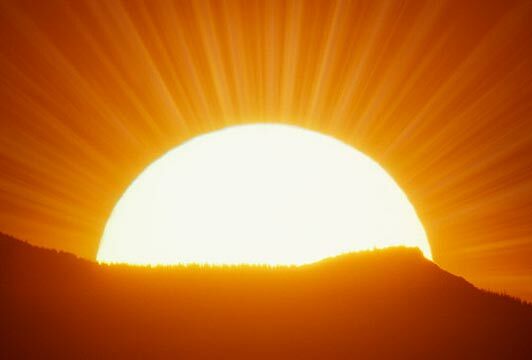 For all living beings Sun represents the positive and primal front. Sun is constructive and creative, The Sun and Moon are considered sovereigns. Jupiter and Venus are ministers. Mercury is the young prince. Mars is the commander-in-chief and Saturn is the servant. Sun is the king and the Moon is the queen. Sun and Moon are also considered luminaries. People with Sun as the ruling planet will have honey color eyes. large and round face, stature will be average. The hair and the colour of the body will have a light shade. Sun rules the direction East and "Grishma" Rithu (Summer season). In the birth chart Sun represents the father of the native. In the woman's chart Sun indicates her husband (There is another school of thought that Jupiter represents the husband in a female's chart). In service Sun shows the administrative head or Government. The Sun offers us the power of resistance and vitality. He governs the breath of life. He rules our consciousness and denotes the individuality. He gives the force and self will and makes one determined and decisive. The Sun in nature is hot, dry, masculine and life giving. He possesses the power of absorption of the nature and influence of any planet within an orb of 8 ½ degrees of his conjunction. Sun represents health, the vital principle, general prosperity and high office, positions of rank and title, government affairs and officials, new undertakings, publicity, popularity, superior or proud and haughty persons. Sun governs the sides, upper portion of the back, heart, right eye of the male and left eye of the female. His day is Sunday, metal gold and color orange. If he is unfavorable disposition or malefic aspects or association and is dignified by position in the horoscope, Sun bestows a nature which is ambitious, proud, magnanimous, frank, generous, humane, firm and honorable. Men who are ruled 6 by the Sun aspire to positions of ruler ship and by their earnest nature inspire others with a respect for their abilities, so they usually attain positions of trust, responsibility and honor where they are perfectly at home and capable of practical execution to a very satisfactory degree. If the Sun at birth is unfavorable and placed undignified, the native is inclined to be too forceful, lordly, domineering, positively arrogant and extravagant, inclining also to sickness of a feverish inflammatory native, eye affliction and heart disorders as well as loss of position, credit or esteem due to impulsiveness of these natives. The Sun's gems are diamond and ruby. Sun owns Leo. He is exalted in Aries and debilitated in Libra. 10 degrees of Aries is highest exaltation point and 10 degrees of Libra is his lowest debilitation point. Initial 20 degrees portion of Leo is his Mulatrikona and the remaining 10 degrees is Swakshetra.